I asked, you answered. Ladies and Gentlemen of The Club, I present to you the chosen one: Dishonored. Grab your blades, put your quietest sneaking shoes on, and prepare to receive your first assignment. It is I, Patrick, your fearful leader! Wait, fearful? Doesn't he mean fearless? No... I mean fearful, because I hope this goes well and at least some people end up being happy. I'm shooting for at least one person enjoying this. Does that include himself? Yes, it does... but if no one else is happy besides myself then I won't be happy, thus leading to a 0% happy rating. Really though, I'm excited, and I hope you are too. Welcome to Game Club! The cheapest I could find was actually this download (Steam DRM) from GameStop at $14.99. Not sure how long that will last! The next best was Green Man Gaming (Steam DRM as well) at . Steam itself is selling it for $29.99. The beauty of this Game Club's chosen one is that it's cross-platform! Here's what I could find for the console versions. Your best bet is to check your local game sellers and hope to spot a used copy, or some sort of special! If anyone finds better deals, be a friend and share them below. Happy hunting. Dishonored is broken down into 9 segments, or missions. I'm breaking that down into 3 equal parts, meaning that your first assignment is to play the first three missions. The first three missions are "Dishonored", "High Overseer Campbell", and "House of Pleasure". This means mission 3, "House of Pleasure", should be completed by next posting. Game length has been a hot topic with this game with reports of completion times anywhere from 4 hours to 20 hours. I'm not going to tell you how to play it, but if there ever was a time to stop and smell the pixelated roses, it's now. 1. Story - This is the thing I'll be exploring the most. I want to break down the writing, structure, and the feelings that I experience. 2. Gameplay - We all know it's important. When thinking about this topic, however, try to think critically. How many ways can things be done? Is there a good flow? What would you change? 3. Visuals - Dishonored is a nice looking game. It's okay to go "graphics! OMG! ", but let's look at character design, level design, and I love to pick out nuance and subtleties. 4. Performance - I love to critique voice acting. A bad voice can ruin it all, but a good voice can make the mundane exciting. 5. Overall Feel - How does it make you feel? Does it remind you of something? Is it pleasant or bittersweet? Or is it atrocious? Be honest. These five points are things I'll be looking at, but they are just ideas. Play how you want to play! Take notes, screenshots, or just play... it's up to you. I am going to encourage critical discussions and debates, though. We could have endless "That part was awesome!" moments, but I want to break this thing down. Most of all, though... Enjoy it! Alright, m'clubsters... I'm shooting for Part 1 to be due THURSDAY 9/5. This gives some time to acquire the game and play the first 3 missions. I'm planning on posting the next part every Thursday as well, which means there is a week between each session. I know we're all busy and have lots of other games to play, so I'm trying not to make the load too much. If you have any questions, comments, or concerns feel free to post them below. I'll try and address everything. If you've already played it, play it again and try new things or look at things you didn't. If the game you wanted didn't get picked... well, there is always the next Game Club! But!!! Even if you didn't want to play this game, it's always good to broaden your horizons and participate in group discussion. Come on! It'll be fun! Okay... Now that we have all the business sorted out. 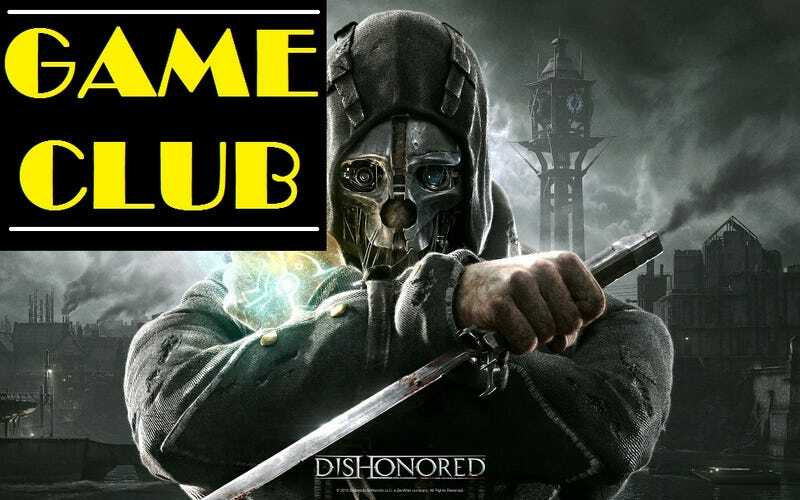 Welcome to Game Club: Dishonored!